Sometimes life takes you off the beaten path of…well, asphalt and concrete. Whether you’re going camping, exploring, or simply have the ineffable desire to do some off-roading, we at Miami Art Cars understand the need to drive simply for the sake and enjoyment of driving. 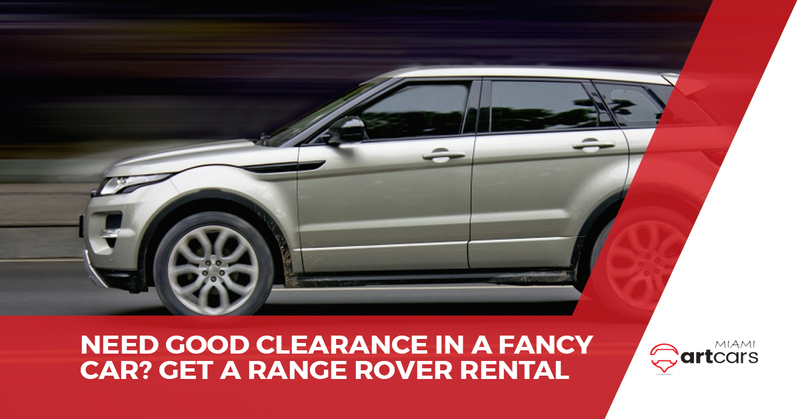 To help you get to where you need to go, sometimes you need an SUV with a little more clearance, and that’s why we offer Range Rover rentals as part of our luxury car rental fleet here in Miami. If a rental SUV isn’t your cup of tea, Miami Art Cars offers many more options in the way of a car for rent. From a Maserati to a Ford Mustang rental to a Ferrari, our fleet has your driving needs taken care of. Continue reading below to learn about what something like a Range Rover car rental can do for you! Have you ever frustratingly yet carefully navigated your car while driving through a congested downtown area, only to scratch your bumper or bottom out and scrape your oil pan and cringe in the process? You can thank all that pesky road construction for messing up your beautiful ride. Queue a Range Rover or Audi Q7 rental: Now, you can blow through construction at lightning fast speeds because you no longer have to worry about bottoming out (Miami Art Cars does not condone reckless driving). Modern SUVs these days tend to feature an air suspension, so you can actually manually control the ride height of your rental vehicle with a simple touch of a button. Have you flown all the way out to Miami to meet with a client, only for them to make the strange request to come meet them in a rough part of town? By rough, we mean rough on your vehicle, considering all the construction that we just mentioned, as well as the crappy condition of roads. With the smooth ride of a Range Rover, you won’t think twice about your immediate physical environment when you’re being cradled in the leathery, well-built luxury of a modern SUV. While you dominate the roads and natural environment with your brilliant piece of machinery, you’ll also look great in the process. Range Rovers are known for their sharp styling and modern elements, so whether you’re rolling around downtown or you’re merely in the suburbs, you’ll look fantastic no matter where you are. No one asks for a 78 horsepower ‘econobox’ when they go to rent a car. With something like a Range Rover or Ford Mustang rental from Miami Art Cars, you’ll have fun and thoroughly enjoy your experience driving around the Miami area. Get the true Miami experience today by contacting our sports car rental company now!